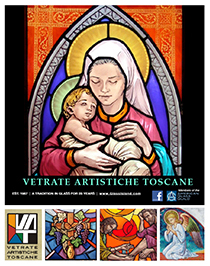 VETRATE ARTISTICHE TOSCANE, will hold intensive summer workshops in the Techniques of Painting on Glass. Duration 2 weeks (Monday to Friday). available dates: see below. Cost € 1,000,00 all materials included. Dates available 1 – 12. The course will take place in our workshop in the very centre of Siena (Tuscany). The student will be introduced to the most refined techniques on how to paint on glass with grisaille and enamels. The subjects will be chosen from drawings of late 19th, early 20th century stained glass, the period during which the top of “virtuosismo” in the field of stained glass was reached, both in the design and technique of applying grisaille and enamels. Indications will be given on the particular techniques used in medieval stained glass (of which Siena was the first school – 13th century) using the materials and technology available at the time and listed in the book by Cennino Cennini (XIV century). This part of the course is crucial in case you have to restore antique panels. The techniques to be learnt are also applicable to more modern styles. How to draw a cartoon using graphite and charcoal. Tracing on glass the guidelines of the drawing, using various media. Shading by brush and study of the effects of the strokes. Mechanisms of interaction between tracing and shading. How to apply enamels to get different tones on the same “tessera” previously shaded. How to apply more than one coat, firing only once: order of application of media. The workshop is of a very high level and suitable for professionals. Glass used is Desag Artist (GNA) and cathedral opaque. Students are expected to have basic glass cutting experience for their project. The course will be conducted in English by Gianni Bracciali on the first week and by Mattia Magnano in the second. Minimum 3 students. Gianni Bracciali, (owner) has worked with glass for the last 30 years and has taught for 20. Booking should take place at least one month before the beginning of the course. Enrollment can only become effective on reception of the required deposit – we will inform you of the method of payment when we confirm your booking. Three-quarters of the deposit is refundable only if cancellation is made 3 months before the start of the course. It is essential that participants carry their own medical insurance. Students should bring their own mask and goggles. The period of the workshop is 10 days (5 days for those attending the first part only). Lessons will take place from 9.00 am to 5 pm Monday/Friday (one hour break for lunch). The workshop will cover all the painting techniques listed separately. EU citizens will need to bring medical insurance cover offered to EU members during a stay in a member country. Your Department of Health and Social Security office will issue this form for you. Non EU citizens need to have an insurance cover valid abroad. Br. Richard Cannuli, Director, Art & Art History, Villanova University, Villanova, PA 19085, Tel:(610) 527 0856. After your enrollment in the workshop has been confirmed, we will send you contacts for housing. Places in the centre are very sought after therefore booking in advance allows better choice. If you are able to find a room/apartment within the walled city, you will not have to rely on public transport as one walks everywhere. The cost of a single room in a shared apartment is Euro 200 – 300 per week. Cost of a one bedroom apartment or studio is roughly Euro 300 – 400 per week. For accommodation during your stay, search https://www.airbnb.com/ or http://www.hotelalmadomus.it . There are other websites where you may find accommodations, such as booking.com and tripadvisor.com. Groceries are less expensive that the UK. Eating out can be very reasonable if you choose the pizzerias and less expensive trattorias. There is an excellent bus service to Florence (1 hour) and Rome (3 hours). Siena is in an good position to explore Tuscany. We can help with itineraries. Public transport in Italy costs much less than in the UK and the rest of Europe. Please do not forget to have health insurance while in Italy.